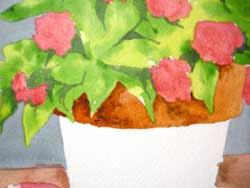 For this installment of the apple and napkin study, I want to get a glaze of color on the flower pot. I have mixed a very wet puddle on my palette of Burnt Sienna, VanDyke Brown and Quinicridone Gold. 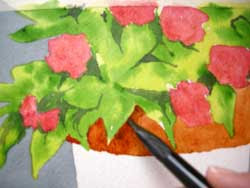 I applied this wash to the top of the flower pot and then, while the glaze was still wet, I applied some of the individual colors directly into the wash, in a wet-in-wet style. I used VanDyke Brown to emphasize the shadows directly under the leaves, being sure to apply it only to one side of the leaf to indicate a shadow. Remember, the light will usually be stronger from one direction, which will cast shadows in the opposite direction. I like adding the colors directly into the wash when creating a flower pot because it replicates the various rust and water marks that usually exist on the clay pot. This glaze must dry before I apply the next wash onto the bottom of the pot. A hair dryer works well to dry the wash if you are in a hurry to move on to the next step.